Developed for added mileage and superior traction in mixed conditions, the AM02C is built for strength, traction and long life. 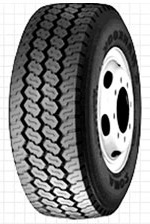 Tread compound and four-belt structure yield outstanding durability. Powerful shoulders offer added sidewall protection. Applied tie bands prevent irregular wear and reduce noise. Square shoulder shape ensures optimal road contact.